On Tuesday afternoon, the number of contestants still locked in a kiss with the car had dropped to 11, and things were starting to get tough. “I’m getting blisters on my mouth,” 21-year-old Alicia Giangiacomo told The Statestman. “Your nose is so red,” a woman told a fellow contestant, as they came up for a break. “Yeah, that was miserable,” he replied. Hours seemed to last longer as the competition went on, so to pass the time some contestants put on headphones and listened to music, while others checked their smartphones or just leaned forward against the car with their eyes closed. 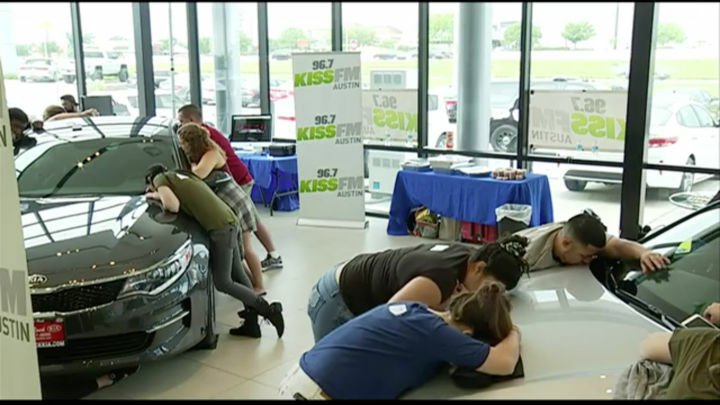 When the 50 hours were up, at 9 a.m. on Wednesday, 7 contestants were still in the race to win a KIA Optima LX. 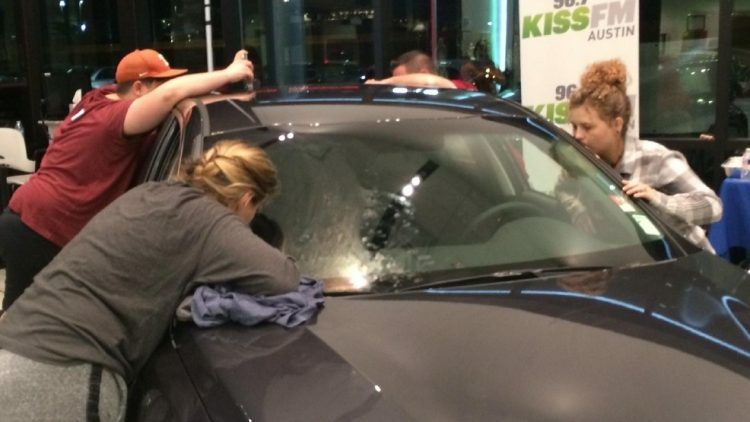 As per the rules of the competition, they were allowed to remove their lips from the car they had been kissing, and the winner’s name was drawn in a raffle. 30-year-old Dilini Jayasuriya was the lucky winner, but the runners up also received consolation prizes in the form of concert tickets. This was not the first time that people competed in a long-term kissing contest for a chance to win a car. China has been holding such bizarre competitions since 2007, and Mashable reports that a car dealership also had people kiss a car for 70 hours, in 2012. What set this particular “kiss a car” contest apart from all the others was that it was broadcast on Facebook Live for everyone to see.